Offering you a complete choice of products which include bank note detector machine and fake note detector. 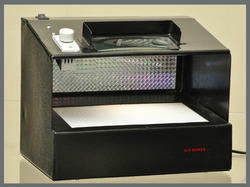 We are engaged in offering Bank Note Detector Machine with a lens. These detectors are known for their ultraviolet and watermark detection. Owing to their neon lamp magnifying glass micro print reading, these detectors are widely demanded by the clients. The offered detectors have a dimmer, which helps in the adjustment of neon lamp intensity. Our offered detectors also have AC filtration that ensures better protection. Owing to their strong and durable metal cabinet with power coming and aesthetic look, these detectors are widely demanded by the clients. These detectors also generate artificial daylight color and micro print examination. We are offering Fake Note Detector to our client.